Hello! Once again I apologise for the inconsistent flow of posts on here.. I'm trying my best! 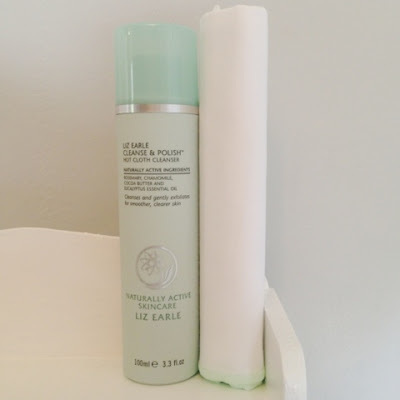 Recently I picked up the Liz Earle Cleanse & Polish Hot Cloth Cleanser. I got the 100ml pump version and 2 muslin cloths from John Lewis. I've been using this every morning and evening for just over 3 weeks, and here are my initial thoughts. The smell is very fresh, it's hard to describe, and can be a little overpowering at first, but you get used to it after a few days - it's a pleasant smell though! The packaging is very nice, and I find the pump dispenses just the right amount for my face. I remove my makeup beforehand, with L'Oreal Micellar Water (which I plan to review sometime soon! ), and fill my sink with hot water and soak the muslin cloth while I apply one pump of the product to my face. I like the fact I can put it very close to my eyes without any irritation. I then wring out the cloth and carefully wipe off all of the product, and then splash my face with cold water to finish. In the evenings, I've been skipping my usual Nivea night cream, but in the mornings, I use this straight out of the shower, towel drying my face beforehand, and apply my normal moisturiser afterwards. After the first few uses, and for the first 4-5 days, I was impressed. My skin felt really soft, and I was feeling good about it. I'd finally got rid of my spots (after being on medication for them), so wanted to incorporate this product into my daily routine to make sure I take good care of my skin. At first, I started to see a few small bumps appearing on my forehead and around my chin. Despite this, was willing to carry on using this product, and hoped my skin would clear up, and it did! I think that my skin was just having a bit of an adjust to a new routine.. clearing it from deep within and all that. I love this product, and apart from the odd spot, the rest of my skin is feeling smoother and looking brighter. Judging by the abundance of 5* reviews online, I'm not the only one who's been converted! I have since had to stop using this product, as I think the cocoa butter in it is too rich for my skin, and my skin didn't clear up completely. I'm really annoyed about this, because it's such a lovely, convenient product, but it just didn't work out for me in the end! Have you tried this cleanser before? I'd love to hear what you thought! I've never tried anything from Liz Earle before but really want to try this cleanser in particular! And I just want to say how lovely your blog is! I literally love it! It's beautiful! Did you do all the graphics yourself? Hey! Ive heard of the product before but was never completely convinced on buying it but after reading youre blog im now certain i want to try it. youre blog is lovely and i love the graphics there so good i wish i could do stuff like that!! And thank you so much! No doubt I'll get bored and change it all again in a few months, haha!